On one of my recent trips back home I found myself wandering about a bright but blustery Belfast and popped into St Anne’s Cathedral to seek a little shelter. St Anne’s is probably the best known church in the city and like many of the city’s most iconic buildings, it’s steeped in history. St Anne’s as the striking building we know today looked somewhat different in its earlier form and was known as St Anne’s Church when it was first completed in 1776. It had been commissioned as a present from Lord Donegall to his wife, Lady Anne. However, due to some arguably shoddy craftsmanship the building sank into the ground and had to be redesigned and rebuilt, which is the beautiful building we have today. 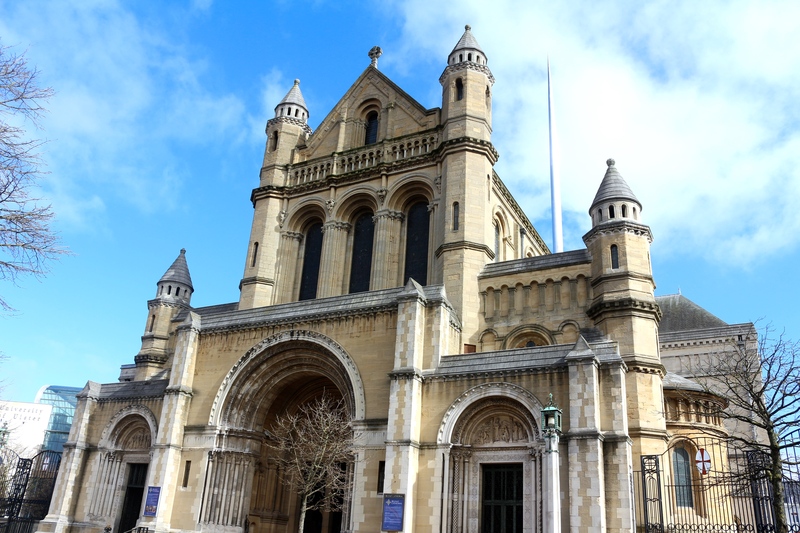 The foundation stone for present-day St Anne’s, (or Belfast Cathedral as she is also known), was laid in September 1899 and construction was carried out around the remaining church building before it was eventually demolished in 1903. The West Front of the building was constructed to commemorate the Ulstermen and women who lost their lives serving in World War I. The Regimental Chapel is seen as the spiritual home to the Royal Irish Regiment and has become a place where those whose loved ones are serving overseas may seek comfort and solace until their family members return home. The intricate artistry of the mosaic-tiled Baptistry celebrates the first blossoms of life while a stunning textile tribute to those who lost their lives on the Titanic poignantly reminds visitors of the brevity of our time on Earth. Visually the cathedral is without doubt a breathtaking place but each of its features from the stained glass parables to the carefully selected scriptures left open on the lectern complement one another perfectly to create a very serene and tranquil environment. Over the years I’ve been in the cathedral a few times for the odd service or two but my strongest association to the church is around Christmas time with the annual ‘Black Santa’ sit-out. The tradition began way back in 1976 when the then Dean, Sammy Crooks, decided to sit outside and beg for charitable donations for the poor which would then be distributed among those in the greatest of need. He sat outside every day for 10 days before Christmas with a small barrel where donations could be placed by those who could afford to support his efforts. ‘Black Santa’ is so-called because of the traditional black Anglican attire worn by Dean Crooks and his successors, who have continued the tradition of the annual sit-out and over the past 30 years have raised millions of pounds for local people and charities in need. Before my career change I worked in community fundraising for a number of charities back home. Community fundraising is just that – local people: individuals; work colleagues and school groups; churches and societies, lending a hand in support of others who are in need. The annual Black Santa sit-out really brings out the best in the people of Belfast and beyond. Throughout the recession Northern Ireland has had quite a bumpy ride and many (if not most) people I know have struggled to overcome what has been a financially strained time. However, each Christmas people continue to dig deeper than they did the year before. Everybody knows what it is to struggle so everybody pitches together to lighten the load a little. I’ve been told it’s a sin to be proud but I’m afraid I’ll have to risk it because seeing the compassion of my countrymen and women, which, in my experience, extends far beyond the festive season is something worth drawing attention to! If you find yourself in the aptly named Cathedral Quarter of the city call in and experience this beautiful space for yourself. There is an admission charge if you are not going into the church to worship and this is £5. Your admission fee includes a guide book. The charge contributes to the upkeep of the building. Normally I don’t agree with churches charging an entrance fee. However, if you are planning to visit the cathedral for worship or just some private reflection then you do not need to pay. If, like me, you want to visit to take pictures then it really is only right to make a contribution so that others may continue to enjoy it in the future just as we have done.